Sandy came and blustered and has left the area but in her wake is extreme devastation. We were spared but spent a chunk of time with no power. Our home is located in a very rural corner of Connecticut on the end of a power line. We generally are the last to get power. After a storm like this we develop power free projects to complete so that we don't go bonkers. 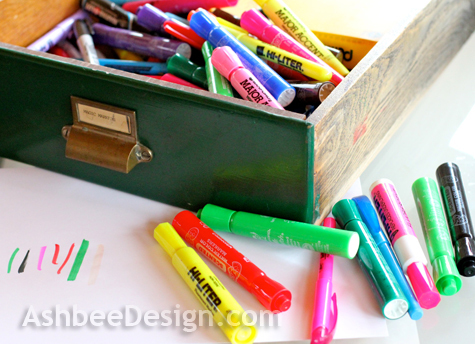 Yesterday, one project I tackled was an easy one - organize the marker drawer. I never throw away a magic marker and I have a drawer full of strays from previous sets. It is frustrating to grab a marker only to discover it is dry. 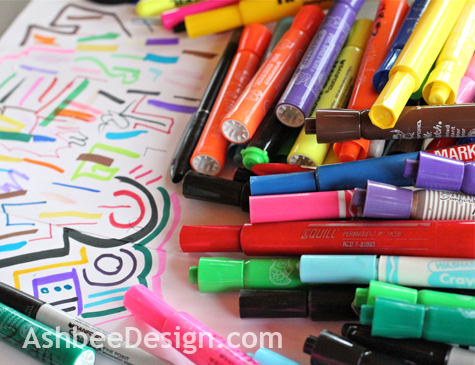 Locating and disposing of dried up markers is a great organizing chore for a powerless day. I sat in the sunroom and opened every marker in every set and tested it. About ten percent were bad. Why then does one always grab a bad one? Must be a law of the disorganized. It was a great chore to get done. How do you spend powerless days? And the good news is that the power came back on at 3:30 this morning. The whole house lit up like a Christmas tree and everything started beeping and whirring. What a wonderful sound!